Featuring the appearance of authentic cedar shakes, DaVinci Hand-Split Shake Siding products are available in eight colors. The composite siding products represents the first time in 20 years that the company has launched a product line outside the roofing industry. 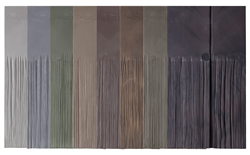 Palette of the five new colors available in composite siding from DaVinci Roofscapes. Just like our roofing products, the new composite siding shakes resist impact, fire, mold, algae, insects, salt air and high winds. And, while they’ll look as attractive as real cedar, they won’t curl, cup or split like real cedar. DaVinci Roofscapes®, a leader in the composite roofing industry for the past 20 years, has launched a new line of composite siding. Featuring the appearance of authentic cedar shakes, DaVinci Hand-Split Shake Siding products are available in eight colors. “We’ve taken all our composite roofing manufacturing expertise and created a durable, aesthetically-pleasing siding product that will not deteriorate like real wood,” says Michael Cobb, president and chief marketing officer of DaVinci Roofscapes. “It’s a natural progression for our company’s capabilities to provide low-maintenance composite siding to the marketplace. 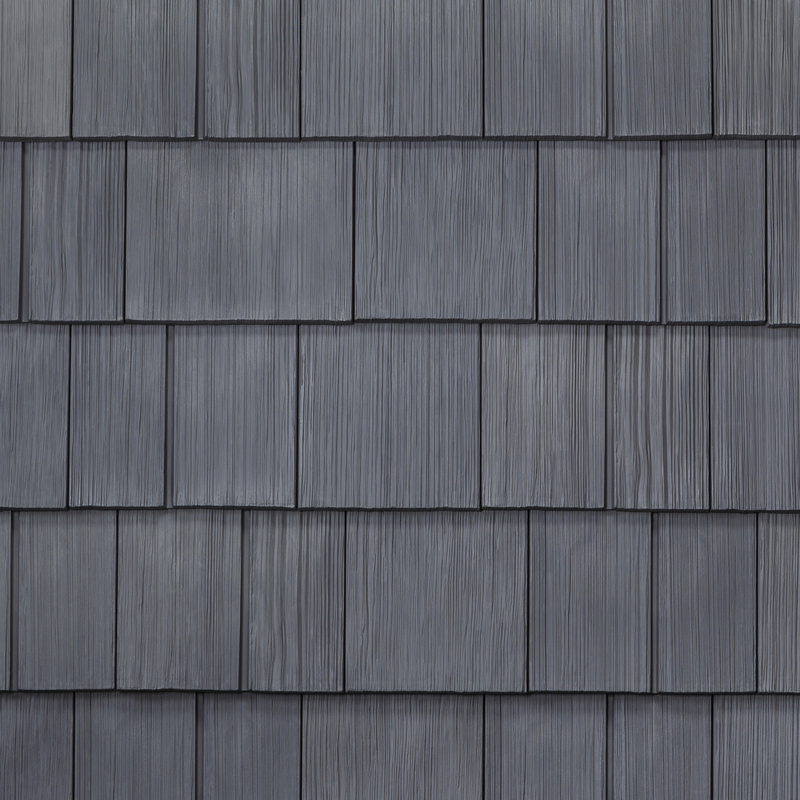 Each tile in the siding line is 18-inches tall with a 5/8-inch thickness and comes in eight- or 10-inch widths. The 10-inch wide pieces have a simulated keyway to give the appearance of four- and six-inch width shakes placed together to provide a multi-width appearance. Made to withstand weather conditions on the roof, the DaVinci Hand-Split Shake Siding tiles are ideal for the exterior walls of a home. Made of virgin resins, UV and thermal stabilizers plus a highly-specialized fire retardant, the siding is resistant to expansion and contraction that can happen with fluctuating weather conditions and temperatures. Manufactured at the DaVinci Roofscapes facility in Kansas, the new maintenance-free composite shake siding is made with color throughout each piece and requires no painting. The tiles are recyclable and serve as an environmentally-friendly alternative to real wood shakes and plastic siding. DaVinci has introduced five new colors for the DaVinci Hand-Split Shake Siding product line: Bark, Granite, Sage, Slate Blue and Taupe. 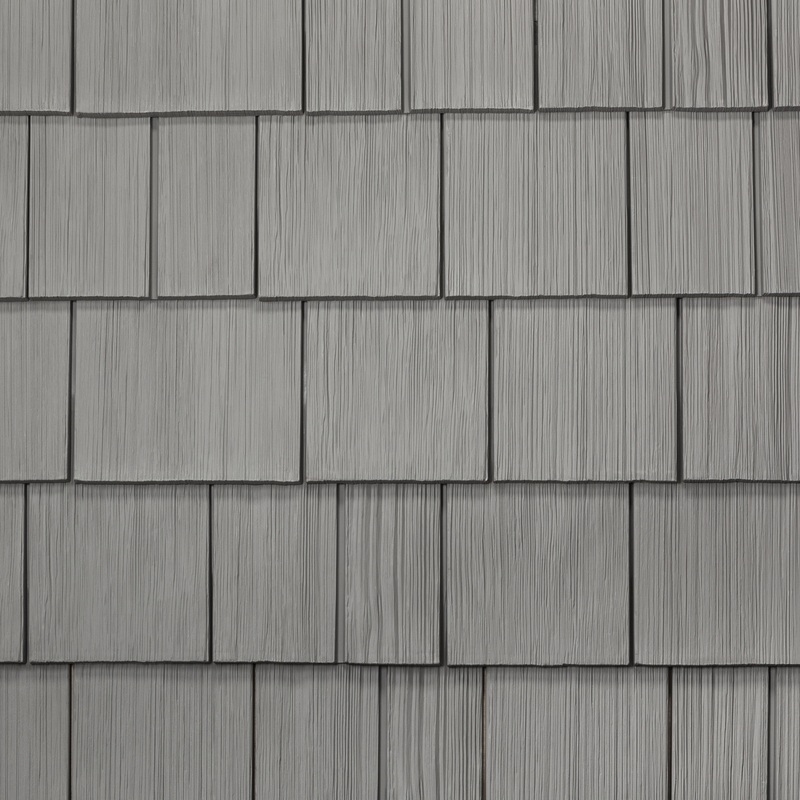 Three additional color blends from the Nature Crafted Collection will also be available in the siding profiles: Aged Cedar, Black Oak and Mossy Cedar. DaVinci Hand-Split Shake Siding products are currently undergoing testing and are expected to meet the same testing classifications as with other DaVinci roofing products. The siding product line is backed by a Lifetime Limited Warranty. The experienced team members at DaVinci Roofscapes develop and manufacture industry-leading polymer slate and shake roofing systems with an authentic look and superior performance. DaVinci leads the industry in the greatest selection of colors, tile thickness and tile width variety. The company's reliable products have a limited lifetime warranty and are 100 percent recyclable. All DaVinci high-performing roofing products are proudly made in America where the company is a member of the National Association of Home Builders, the National Association of Roofing Contractors, the Cool Roof Rating Council and the U.S. Green Building Council. For information call 1-800-328-4624 or visit http://www.davinciroofscapes.com.